As part of Latino Heritage Month, celebrating Latino and Hispanic cultures, ABC7 spoke with Manuel Villacorta and how his Peruvian roots have given fruit to his labor of love for health. SAN FRANCISCO (KGO) -- As part of Latino Heritage Month, celebrating Latino and Hispanic cultures, ABC7 is highlighting organizations and introducing you to community members where you live. Manuel Villacorta is author of four nutrition, wellness, and weight loss books. His passion for health and sharing the benefits of it starts in his own kitchen. His zest for life is evident in his mantra: "Health is not a diet plan, but a lifestyle. Understand your body, your strengths, and your limits and use this knowledge to make a change. Stop dieting, start living." His Peruvian roots have given fruit to his labor of love for health. He's a dynamic speaker who shares his passion locally, nationally and globally. He invited us into his home for practical advice on eating and to share some typical dishes from Peru. He says food is about love, family, friendship and it brings people together - "start living." When you make it about a lifestyle, you can look at it as an 80%/20% split on how you eat: 80% is eating the right foods, 20% of the time give yourself permission to eat those pleasurable foods. He suggests building a good relationship with food to avoid feeling guilty. Some of the key superfoods to integrate are: avocado, broccoli, oranges, blueberries, strawberries. In the 18 years he's been a dietician, he's published four books: Peruvian Power Foods, Whole Body Reboot, Eating Free, and Flat Belly 365. They cover topics such as intestinal health, probiotics/prebiotics, and eating the right fats! For more information, visit: www.manuelvillacorta.com. Get a full look at the celebration of Latino Heritage Month here. 1. Cook the potatoes in water with salt until they are soft, about 20 to 25 minutes. Drain and let cool. 2. While the potatoes are boiling, in a separate bowl, mix together the tuna, celery, onion, cilantro and the mayonnaise. 3. When the potatoes are cool enough to handle, mash them by hand. Mix the potatoes with oil, aji paste, lime juice and salt and black pepper. 4. To arm the causas, divide the mashed potatoes into four portions, the avocado into four portions. Press one potato portion onto the bottom of a plate. Spoon the tuna mixture over the top of this potato layer, add a quartered of the avocado and cover with the second portion of potato. 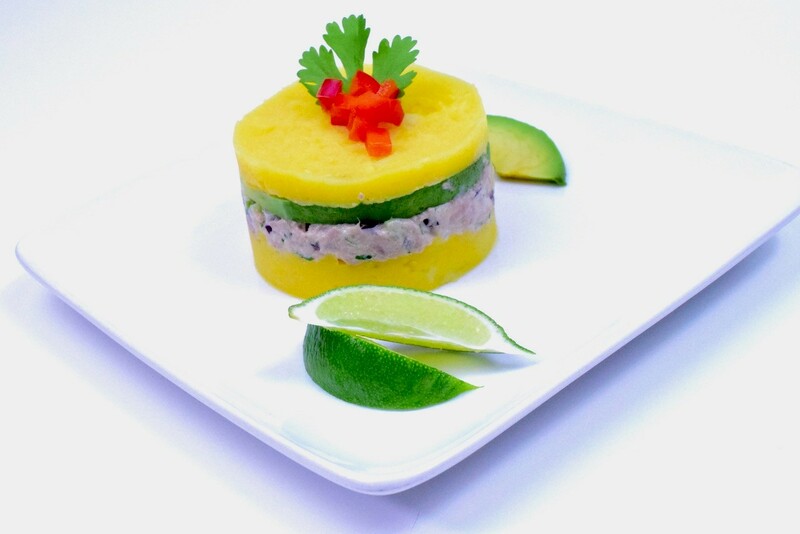 Notes: You can also use a metal ring as a mold to arm the causas. You might have some tuna salad left. Refrigerate and use it as needed. For Chimichurri: Put all the ingredients in the bowl of a food processor and process until smooth and homogeneous. For Yucca: Slice the yuca into 3 equal-length portions. Holding each portion on its axis, carefully slice off the outer peel and discard. Chop each portion in half lengthwise and then into 8 wedges. Put the yuca wedges, water, and salt in a medium saucepan over high heat. Bring to a boil, cover, and reduce to a simmer. Cook for 20 minutes until tender throughout. Drain and let cool. 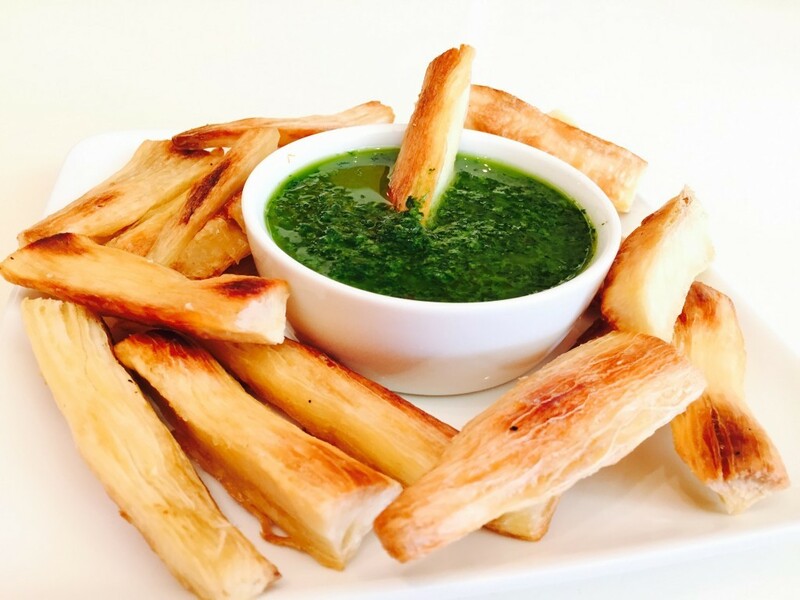 Place the cooled yuca on a large baking sheet and spray with canola oil to coat. Season with salt. Bake for 40 to 50 minutes, flipping once halfway through the baking process, until the fries are golden in color. Serve warm that day.